ConservativeHome's ToryDiary: How will Labour oppose Cameron? How will Labour oppose Cameron? Should Blair be painted as a left-winger in disguise? That analysis produced the disastrous New Labour, New Danger devil eyes campaign. Or should he be painted as an unprincipled lightweight? Phoney Tony? What about attacking him through the people who he gathers around him? Mandelson. Campbell. Derry Irvine. Tony's Cronies. Should DC be framed as a smiling frontman for extreme policies on Europe (EPP), the flat tax and marriage? Labour Chair, the often incomprehensible Ian McCartney, has said: "The Conservatives’ current rebranding exercise is simply putting a new gloss on the same old Tory politics." 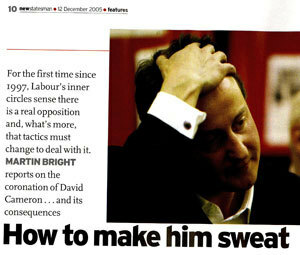 Should DC be presented as lightweight and inexperienced - particularly when set against Gordon Brown? Should his Etonian background and Notting Hill set be attacked? The too-posh-to-understand-real-life attack is certainly being sharpened for possible use against Shadow Chancellor George Osborne who will inherit the Osborne and Little wallpaper fortune. If there is an economic downturn Labour strategists believe that Brown will be more trusted to get hard-working families out of trouble than a bunch of inexperienced toffs. Today's Times notes that - predictably - the Blair and Brown camps can't agree on how Mr Cameron might be defeated. The strongest (and riskiest) attacks on Mr Cameron will be executed by surrogates. Thursday's Skinner attack on George Osborne may have been a freelance operation but it will certainly be a model for things to come. ""We realise we are up against a Premiership team now, when we have been dealing with a Championship side so far," is how one senior aide to the Prime Minister described the Tory challenge to me. In the laddish world of new Labour, where football is the lingua franca, this is a considerable compliment to David Cameron. Admittedly, it was followed by a swift qualification: "We are fighting a proper oppo-sition, but it is not Chelsea." Yet Tony Blair's team believes Cameron will give Labour the first real competition it has faced in a decade, and that is a tribute to the 39-year-old newcomer, who has been playing in the top league for only four years." Policy change must also form part of Labour's response. Just as many Tories urged John Major to put "clear blue water" between him and the new Labour leader in the mid-1990s some left-wing Labour MPs are urging more redistributive policies in the imminent post-Blair Labour era. Today's Independent reports suggestions by a former Downing Street adviser, Patrick Diamond, that Labour should make the tax system more progressive: "As Mr Cameron tries to invade Labour's traditional ground on social justice, Mr Diamond says that Labour must show this is incompatible with the Tories' "minimal state" Thatcherite ideology." There is a good comparison there between how Blair was dealt with and Cameron will. Though I'm confident that between the Blairites and Brownites every line of attack, however contradictory, will be used! Labour people, while Tony Blair (educated at the hardly bog standard Fettes public school and Oxford) leads them,are on very shaky ground when it comes to attacking DC's Eton and Oxford educational background. I think the best take on TB over the years has not come from Conservative Party but fron the "St Albions" column in "Private Eye" in which Blair is portrayed as a trendy Anglican vicar who is never wrong (in his opinion! )Great satire. Ironically, so far Labour seem to be sticking to a 'New Conservative, New Danger' style attack. That McCartney phrase about putting 'a new gloss on the same old Tory policies' quoted above has also been used already by Gordon Brown and Ben Bradshaw. Although thinking about it, the William Hague morphing into Thatcher ads were in a similar vein, I suppose. The more divided Labour are over their handling of Cameron, the weaker their attacks will be and the more likely Cameron will survive them. More than ever New Labour need their pagers and their robot controllers at Millbank, but they are gone and it shows. They really have nowhere to turn. Inverse snobbery won't work as it represents a world to which an ever increasing number of people aspire in order to break free from the appalling state and the 'inexperience' won't wash as he leads a team full of experience and talent. In my opinion Labour are about to make a hash of it. They appear to be coming to rest on the "paint him as a right wing wolf in sheep’s clothing" forgetting that that is precisely what they have leading them and precisely what the electorate have told us three times that they want. Its the ideal solution. Cameron spends the next three years confidently espousing compassion and tolerance in a way that looks right and will reassure and attract many, whilst Labour constantly remind us that he is right wing at heart. It's exactly what everyone wants to hear. Lets hope Labour do move to the left. After all the further left they go, the worse the economy will get, the more likely voters will look elsewhere. The electorate as a whole does not like left wing parties and painting Gordon Brown's Labour Party as old left wingers will be much easier. Labour are in the same situation we as a party were some time ago. One day we accused Labour of stealing our policies - the next we accused them of still being Socialists underneath. There is distinct disquiet in Labour ranks as to how to deal with a reinvigorated Tory party. Could the fact that we have a new vibrant young leader have a major impact on their own leadership election - with the favourite Brown suddenly looking old fashioned and behind the times I wonder. Anybody else wonder if the 'New Conservatives, New Danger' attack might badly backfire for Labour, much like Wilson's scare tactics about the Selsdon meeting did? I get the feeling that the electorate are shifting Rightwards these days - chary of higher taxes, and concerned about immigration and crime. Our problem has been that we're seen to do these things from mean motives. The danger with Cameron is that in tackling this problem we're going to be seen as nice-but-ineffectual. If Labour then start saying "no, they're really going to do it, too," it plays right into our hands - people will think we're Right-wing but with good intentions, and we benefit. The same applies if they're provoked into lurching Leftwards - not only (as Rob says) will the policies be disastrous anyway, but they'll be seen as a distraction from public priorities. It will be the Labour Party talking to itself, not the country - much like we ended up doing in 1992-1997. If they go go down this road, we shouldn't lose our nerve. Although I don't like the term, I fully support the social justice thing - but we shouldn't buy into the media categorisation of this as us moving to the centre, or even attacking on the Left. If the Labour Party goes for further redistribution, we need to point out that the deepest problems of poverty today are not a lack of material wealth, and that redistribution is a 1940s solution which can often simply deepen the problems we face today. I would think that Brown could only be beaten by an outstanding candidate. The question is, have they got anyone like that? At the moment no one springs to mind. Someone suggested to me that Benn might be a possibility. I have also heard that Benn is tipped to be Labour leader some time in the future, probably wouldnt challenge Brown now though, unless Brown's position weakend dramatically. I reckon the same goes for any of the younger Labour lot, they will not oppose Brown but will wait till he gets kicked out by the electorate. Rob - Ive heard something similar from Labour sources. Alan Johnson - though not young, is also seen as a rising star. Ive heard talk that yes Brown will get it - but they are already thinking about a hung parliament or worse - which would mean Brown could be out before ever seeing Number 10 (well apart from living in it as Chancellor). Wouldn't that be a shame! Want to know how Labour intend to oppose Cameron? With their usual mixture of lies, smears, misinformation and their general message of "if you're even thinking of not backing Labour, then you must be, (perm any two from), racist/homophobic/sexist/stupid/selfish". If you don't believe me, read the e-mail sent out by Labour in the name of Jo Brand, who is, allegedly, a comedienne. For all Cameron's affectation of "consensus", he needs to realise that the Labour party actively hate the Conservatives and will do anything to stop us. It's about time we adopted their mindset, which is, "This is politics. It's not the taking part that matters, it's the winning that counts". I'm Jo, a Labour supporter and you may have seen me on telly. Have you noticed the big news this week? David Cameron (Dave to his friends), an old Etonian distantly related to the Queen, has been elected leader of the Conservative Party. At last, it has dawned on Tory members that they need to be in touch with the reality of the modern world and the lives of the majority of British people! As his first step, Dave is bringing back that icon of the new century William Hague to the front bench. So I'm asking you to dig deep into your pockets. Let me explain why. No one seems to know a lot about what Dave actually believes in but we have a few clues. We do know that he first emerged as a special adviser to Norman Lamont, standing right behind him on 'Black Wednesday' as Norm was announcing a "turbulent day on the markets", or 15 per cent interest rates to you and me. In his four years as an MP, Dave hasn't been notable as a champion of change and modernisation of the Tories' policies. On the contrary, like his Tory colleagues he voted against the extra spending on the health service and schools, opposed the Winter Fuel Allowance and voted against increasing maternity leave and pay. He voted in favour of keeping fox hunting. He didn't just support the Tory manifesto earlier this year, with the policies to subsidise private health care and private education and the irresponsible focus on immigration, he wrote it. Dave is passionate about one thing, not saying what his new policies will be. The one glimmer we do have is that he is looking at a flat tax. This is the new idea sweeping Estonia which means that nurses and home helps pay the same tax rate as the millionaire. Alongside that he wants a new spending rule which would have one result - billions of pounds of immediate cuts in public services, just when we are seeing real improvements working through. The Tories think that they have the whiff of power in their nostrils and they will be willing to do and say anything to get it. The Tory press are lining up as cheerleaders and we can expect multi-millionaire backers to throw any amount of money at the Conservative Party if they sense a real chance of victory. So we need our supporters to stay with us too. Spend a few moments and make a donation. A tenner to help keep the Tories out of government? It's cheaper than paying 15 per cent interest on your mortgage that's for sure. Do they have a picture of that ugly fat cow to go with the e-mail. Cameron is the best chance that the Tories have to beat Gordon Brown. With Brown's new screw up of the budget and the economy, it doesn't give him the best start for a leadership bid. I'm fed up with Labour's same old bulls**t facts and stats of unemployment and the fact that everytime they are asked a question, they refer to an old Tory policy that was scrapped years ago. Screw Blair, Screw Brown, SCREW NEW LABOUR. NEW LABOUR, SAME CRAP ! VOTE CAMERON IN 2009. I WILL BE ! Odious as Brand's e-mail is, it's a pep talk to the comrades in order to raise money - it doesn't mean they won't use the same line of attack with the wider public but it is no guarantee that they will do so either. "Give us a tenner, go on, aww please, be a mate - it's nothing compared to how much extra Gordon's going to be taking from you in taxes in the next three years anyway"